Back in early September, Tech football looked promising. Ranked in the top 25 to start the season, the Jackets rolled through the first few games. Not to dwell on the past, but the preseason rankings were short lived, the dark horse dreams quickly became comical, and Tech students were promptly reminded that they certainly didn’t come here for the chance to celebrate a National Championship. Five and a half months later, it’s finally baseball season. Just as they did in the fall, Tech fans are looking on with hope. This time around, the Jackets just might come through. The Jackets took the field this weekend for their opening series defeating Purdue 5-2, Western Michigan 13-0 and VCU 9-1. Let’s go beyond the box score and take a look at five things we learned this weekend about the Tech baseball squad. Pitching was huge for the Jackets last season and looks as though it will be again this year. The pitching staff gave up just three runs all weekend and only one of them was earned. In his first career start, freshman Jonathan Hughes gave up just three hits and no earned runs, notching his first win Sunday against VCU. The other two Tech starters from the weekend, Brandon Gold and Jonathan King, also had solid performances, racking up five innings apiece. It is worth noting that Gold and King both walked three batters, but Gold managed to strike out eight. The bullpen followed suit, despite the absence of one of the best closers in college baseball, Zac Ryan. While Matthew Gorst pitched well and picked up the only save of the weekend, it seems highly unlikely that Ryan got beat out of his role. Ryan will play a crucial role in a Jackets bullpen that will be a key factor in whether Tech can do any serious damage in the ACC this year. A.J. Murray was the power behind Tech’s offense last year, leading the team in home runs and RBI’s. Unfortunately, the Jackets no longer have the luxury of Murray’s services; the stalwart catcher now finds himself in the Minnesota Twins’ minor league system. The loss of Murray would seem to leave a considerable void; only two other Tech players hit home runs last season. This weekend, however, the offense showed it could produce. Three individuals managed to clear the fence, and of the seven players with at least ten at bats, four of them are hitting over .400. Kel Johnson and Matt Gonzales both had solid years in 2015 and will be looked upon to support the offense all year. Johnson went 5-for-12 with a home run and four RBIs while Gonzales went 5-for-15 with two doubles and six RBIs. Obviously, with only a fraction of a season in the books, there is good reason to throw caution to the wind; this is a small sample size against mostly mediocre pitching, Nevertheless, 27 runs over the course of 3 games is an impressive figure and offers optimism regarding the Jackets’ ability to move on from last season’s offensive centerpiece without a significant drop-off. This weekend, the heart of the lineup showed they can drive in runs. Between the two of them, Gonzales and Johnson knocked in 10 runs. Those two will bring in runners all season, but the key will be getting those runners in scoring position. Wade Bailey’s OBP was an impressive .600, and he scored 6 runs, doing his job as the leadoff and then some. Ryan Peurifoy didn’t play poorly by any means out of the two hole but wasn’t on base quite as much. As long as those two can consistently get into scoring position, Tech will likely have no problem scoring runs this year, even against a typically difficult ACC slate. Coming into the season, Tech boasted one of the best recruiting classes in the country. Throw in a couple stud sophomores including Kel Johnson, and Tech baseball figures to be a force for the next few years. From a pitching perspective, Jonathan Hughes dominated his first start. From the relief side, Burton Dulaney pitched three good innings, giving up neither a walk nor a run. Dulaney should see a lot of innings this season and hopefully for years to come, if his stellar start is any indication. Tristin English is another freshman who could do some damage with the bat. He started slowly, a result that is to be expected; he is only 18 years old and undoubtedly talented, given the Major League Baseball offer he spurned to play on The Flats. With more plate appearances, he could soon prove himself a real asset to a lineup that already presents plenty of concerns for opposing pitching staffs. Tech has a lot of winnable games on the schedule but also has to play at FSU and at UVA. If the offense can continue to produce, Tech will win a lot of games, including those tough ACC matchups. Armed with a solid core of starting pitching and one of the best closers in college baseball, the pitching staff should keep the Jackets close in almost every game this year. This weekend was a small sample size, and if the 2015 Georgia Tech football team taught us anything, a few games against mediocre competition can give some very false implications for the rest of the season. In a fanbase where hope is in short supply, though, a strong start could provide the oxygen needed to continue. The season has been unkind to Tech in a variety of sports. 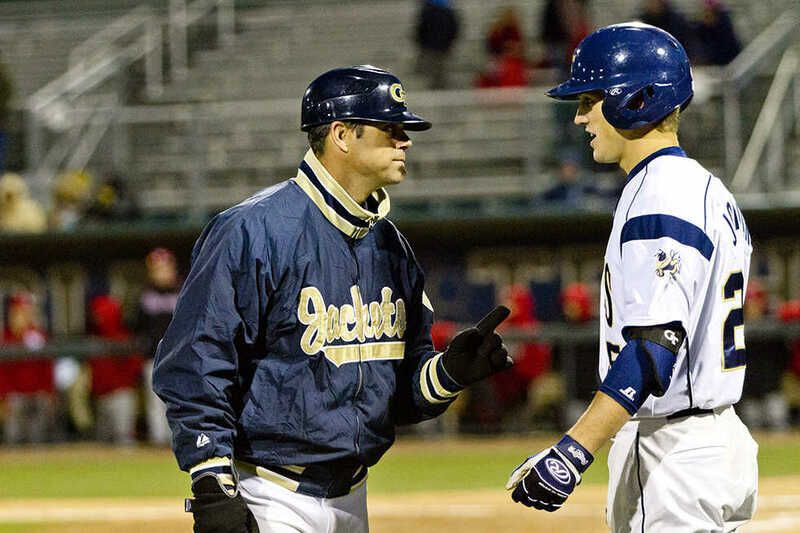 Perhaps the Jackets will find relief in American national pastime.